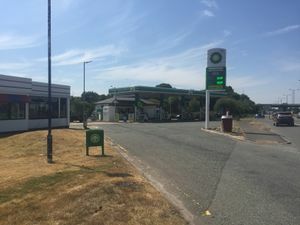 A pair of petrol stations south of Derby. Although they are connected directly to the A38, traffic can use a nearby bridge to move between the two sides. Only the northbound petrol station is open after 11pm. Both petrol stations appeared in the 1970s, shortly after the A38 was upgraded to become a dual carriageway. The northbound petrol station has a property called The Bungalow. In the late 1970s the Eggington branch of Little Chef opened next to the petrol station (also providing access to a house). This closed in around 2005 and became the OK Diner. 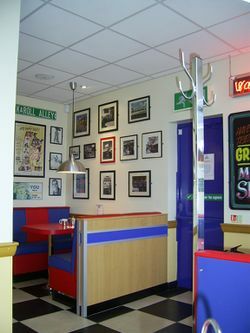 The shops are both branded as KeyStore Express, even though they are actually Londis stores and are advertised as such from the Londis website, totem poles and offers inside the store. In 2008 Derby with Burton opened one mile to the north, providing some competition.